The great organ surges with power. The behemoth American-made 1908 Robert Hope-Jones pipe organ easily fills the 100-year-old, 6,000 seat Great Auditorium with body vibrating sound waves. The National Anthem plays and at the last chorus, the large wooden American flag over the broad stage lights up in a carnival display of patriotism. The show commences: Michael Feinstein and Linda Eder enter the stage and enthrall the audience of the sold-out concert for the next 2 1/2 hours. The Reverend William B. Osborn may not have approved even this mainstream entertainment when he founded the Ocean Grove Camp Meeting of the United Methodist Church in 1867. The Rev. Osborn was following a well established tradition along the Jersey Shore, starting in the late 18th century, of creating havens of calm in the barrens along the ocean, far from the bustle and temptations of urban life in Camden and Philadelphia. Although Cape May, Ocean City, Vineland and many other shore towns that started as Protestant camp meetings morphed into resorts, Ocean Grove remained true to its original mission. That mission in the 1860’s included open support for racial and women’s civil rights, education reform and prohibition. Ocean Grove is still a dry town (Asbury Park and Bradley Beach are right next door) but its relaxed fundamentalism encouraged non-camp followers to settle. Today the Rainbow Flag flies from nearly as many houses as the United Methodist Church banner. The houses of Ocean Grove are stunning. The one square mile has national historic designation with the largest concentration of original late 19th and early 20th century architecture in the country. Rarely will anyone find real estate that exemplifies the ultimate in wood craftsmanship, and this exuberance for decoration keeps many 21st century craftsmen employed by the demands of constant maintenance. Ocean Grove, a mere 90 minute drive from Philadelphia, is still a glimpse of what the Jersey Shore used to be like. The boardwalk is a walkway – no food vendors, no video arcades. Pedestrians rule and with most streets narrow, driving faster than 25 mph is difficult. On summer weekends parking is impossible. Most people arriving Thursday or Friday for a weekend never move their cars until leaving. Ocean Grove is a perfect walking town where Main Avenue is never farther than a five-minute walk from your B & B, and kids are safe riding bikes and skateboards. An evening’s biggest treat is catching a concert in either the Great auditorium, Wednesdays and Saturdays, or the boardwalk’s pavilion and always having ice cream at Nagles or Day’s – very partisan as to which one is the best! 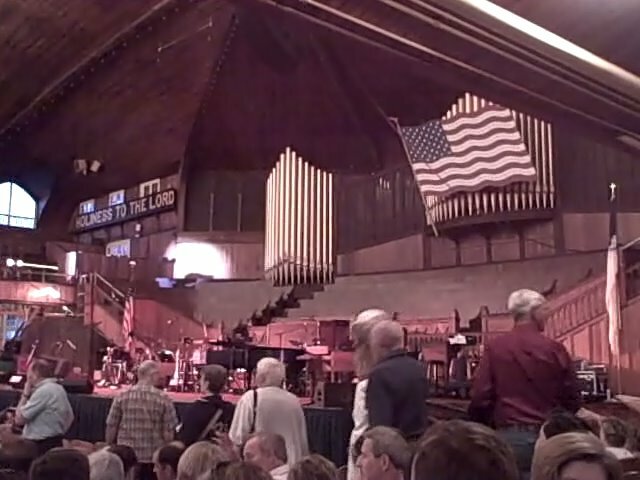 The center of Ocean Grove is the Great Auditorium with its magnificent pipe organ. This all wood, barrel-vaulted 6,000 seat structure is an engineering marvel with acclaimed acoustics making it a sought after summer concert venue by A-list performers. Besides concerts, the auditorium is the focal point for the Camp Meeting’s summer religious activities including an active youth program. Anyone’s invited to participate in Camp Meeting activities. Surrounding the Great Auditorium is an oddity to all new visitors. Dozens of white tented structures in close formation are what remain of the original tent city that was the camp meeting. As affluence allowed for the building of the Victorian houses, the number of tents diminished. 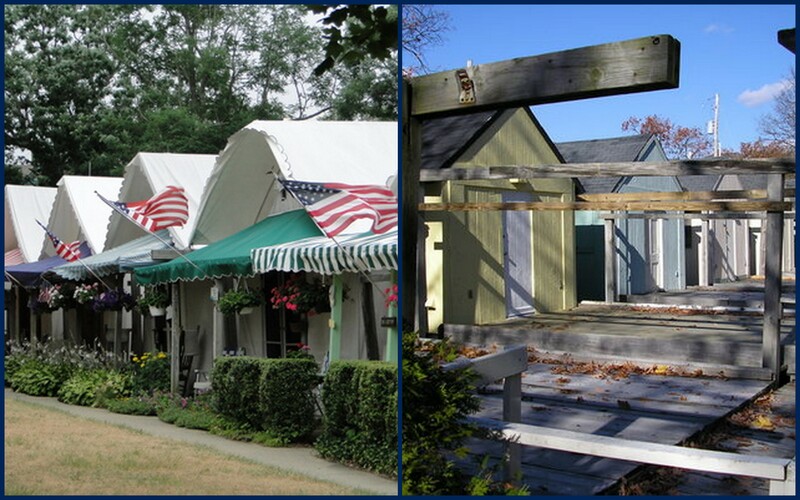 The remaining 142 half tent/half wood cottages are on long-term lease to Camp members and frequently passed down to the generations. Spreading majestically for at least a 1/4 mile from the Great Auditorium to the beach is the wide, landscaped Great Lawn. Closer to the building itself, numerous antique and craft markets are held from July through October. The commercial district is small, occupying the better part of six blocks along Main Avenue and a few blocks off Main. 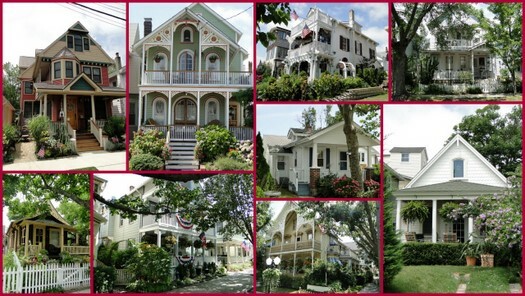 Being northern New Jersey, Ocean Grove is not a winter ghost town. With direct train links to New York, half the population is permanent, providing a base for shops and restaurants that are not all post cards and cotton candy. Cheese on Main, 53 Main Avenue, offers more varieties from more countries and animals than you imagined. The Emporium At Ocean Grove, 63 Main Avenue, and Ocean Grove Trading Company, 74 Main Avenue, have imaginative, and well made, women’s fashions. Just off Main, the Beach House, 52 Pitman, is the place for souvenirs and gifts with class, and Tumblety Howell Art, 45 Pilgrim Pathway, highlights top works by area artists. Dozens of bed & breakfast and hotels, all historic structures, are either on the beach or within three blocks. Some of the best, such as the Laingdon Hotel, 8 Ocean Ave, remain open year-round with a glassed-in porch. 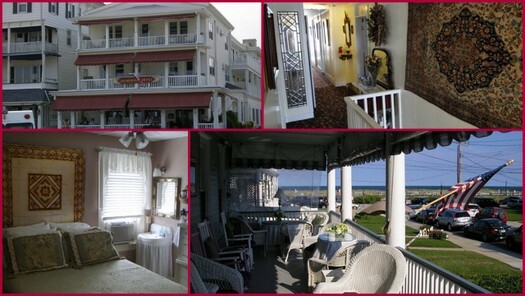 The Shawmont Hotel, 17 Ocean Ave, provides well-appointed rooms with private bath, a continental breakfast, a beautiful porch with rocking chairs and a full view of the ocean. Bath Avenue House, 37 Bath Ave, a beautifully restored 80-year-old prior rooming house. The 30 rooms are on the small side but individually decorated, air-conditioned and with a sink. All rooms but one (on the first floor) share bathrooms located on each of the three floors. There are so many repeat guests, that sharing a bath seems no more odd than having house guests for the weekend. A full breakfast is included, and filling. The Carriage House B & B, 18 Heck Avenue, an elegant eight room inn, provides an equally elegant breakfast making it an excellent choice for food lovers. 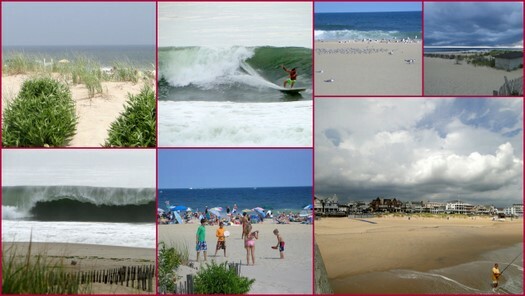 Ocean Grove is a dry town, but Asbury Park and Bradley Beach are within walking distance along the boardwalk. 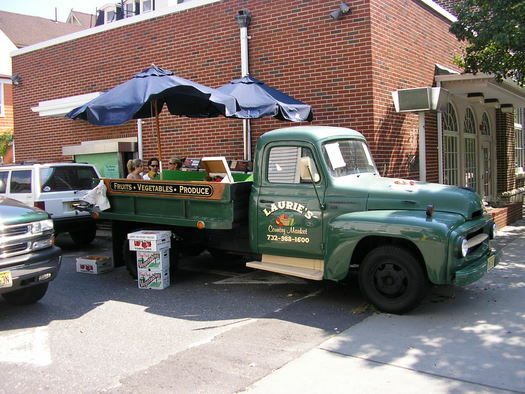 Many Ocean Grove restaurants are discretely byob, but inquire first. I would not say that the restaurants are outstanding but neither will a customer feel they have had a bad meal in any establishment. In summer, all seem to take advantage of New Jersey’s abundant summer produce. Among my recommendations are: Bia at the Majestic Hotel, 19 Main Ave., for imaginative presentations and an eating porch with an ocean view. Sea Grass, 68 Main Ave, serves generous salads and sandwiches including a killer BLT – but this is bacon, lobster and tomato – on a large toasted soft bun with sweet potato fries. Nagles Apothecary Cafe, 43 Main Ave, complete with soda fountain, has been an Ocean Grove institution for over a century – first as an apothecary and now a popular restaurant serving generous portions of classics for breakfast, lunch and dinner. The outside walk-up ice cream window dishes up dozens of rich creations and along with Day’s Ice Cream, 48 Pittman Ave, have loyal partisans who line up every day. On weekend evenings, the lines at both places can be blocks long. The Starving Artist at Day’s tries to focus on healthier ingredients and serves a good breakfast with interesting omelet fillings and pancakes. The charm of Ocean Grove, it’s a place where all you want to do is wait patiently and let the calm take over.